TOHATSU's line of 4 stroke engines are light and compact available from 2.5 to 250 hp. You'll be impressed with the features each size provides - and your crew will be impressed with how quiet and smooth our 4 strokes are. Get the details. Our first priority when developing these engines was to make them lightweight and compact without compromising reliability or the quality performance associated with the TOHATSU brand name. We have maintained the durable standard features that TOHATSU owners appreciate while making fuel-efficient 4-strokes that are easy to transport. These outboards are compact 2-cylinder, SOHC engines that have been manufactured to comply with all 2006 US EPA emission regulations. 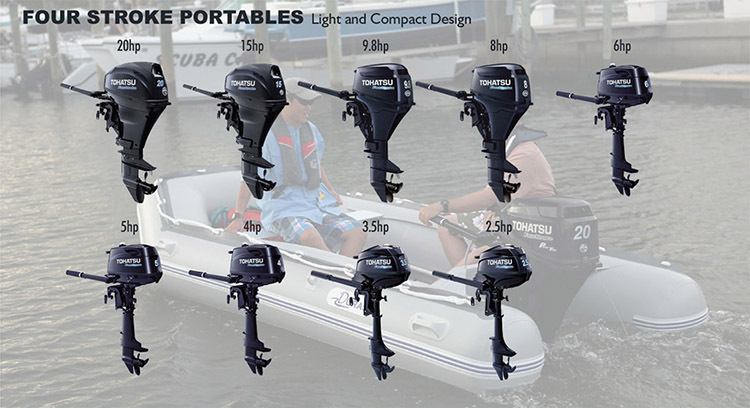 TOHATSU offers an outstanding line up of four stroke outboard motors, including the 90 hp, 75 hp, 60 hp (standard and "power thrust"), 50 hp, 40 hp, 30 hp and 25 hp outboard. TOHATSU’s 4-stroke outboards have all the features you are looking for and provide boaters with excellent fuel economy. These engines also include our 5 year limited warranty and meet all EPA emission regulations as well as earning a CARB 3-Star "ultra-low" emission rating. 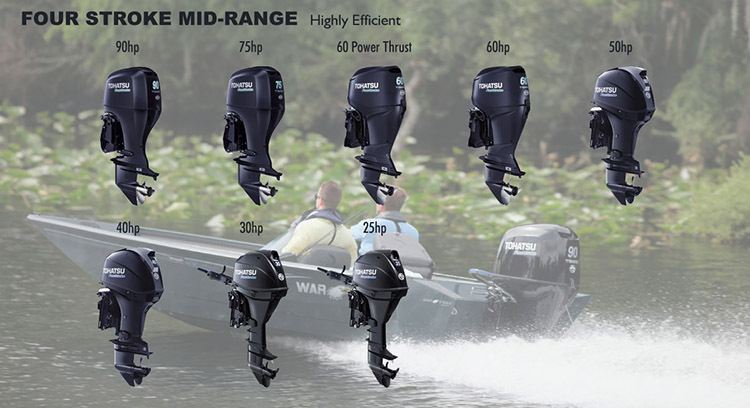 Click each outboard boat engine above, from 25hp to 90hp, for more information on mid-range four stroke outboards. 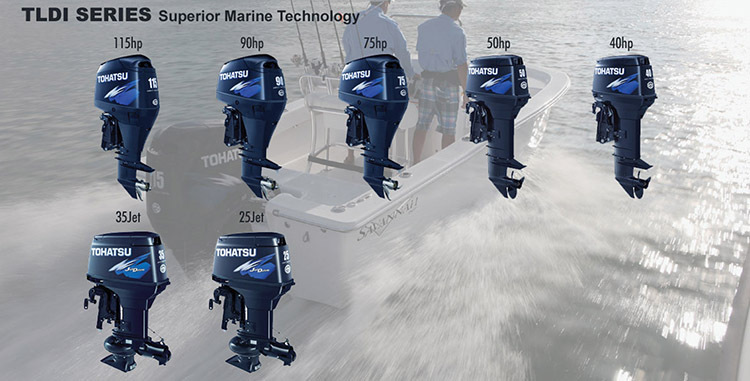 TOHATSU offers the best outboard motors, including the 115 hp outboard, 150 hp outboard, 200 hp outboard, 225 hp outboard and the 250 hp outboard. These TOHATSU 4-stroke boat motors have outstanding features that provide boaters with unmatched technology, proven reliability and the big power you have been waiting for. 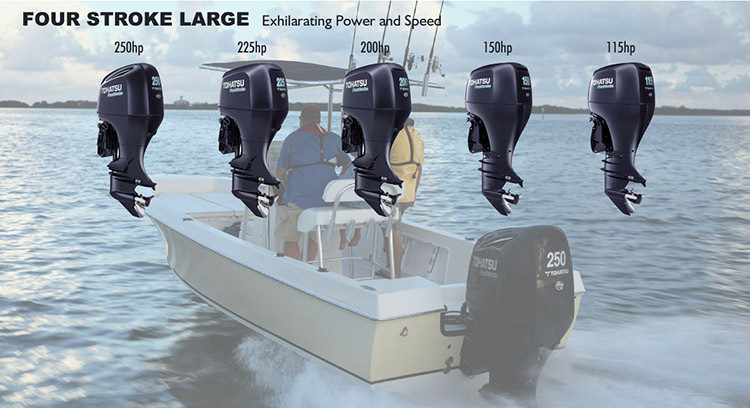 Click each outboard boat engine above, from 115hp to 250hp, for more information on these amazing four stroke outboards. We’ll be happy to answer any of your questions about TOHATSU Outboards, schedule work to be done or help you figure out just which motor is the right fit for your boat. We carry many TOHATSU Outboards in our showroom but we can aquire any motor that you might be looking for from the TOHATSU line.